Abstract: There was a lot of anticipation in the lab as we set out with a fresh pair of Corsair XMS3500 DDR in hand to see how the KX400-8XV would perform. It wouldn't be much of an understatement to say that everyone's attention is firmly focused on nVidia's Nforce 2 chipset - and the boards that support it. Can a chipset really come before the motherboard, or even CPU in order of importance? Some of you are right now nodding your heads and saying "yes" to that question, but is this just isolated to the nForce2 chipset? Unfortunately history seems to show us that like the even-numbered Star Trek movies, VIA usually needs two tries to get things right. The KT133 and KT133A, KT266 and KT266A chipsets stand as prime examples of what we mean. Even VIA's KT333 chipset had some issues just before it was released and had to be tweaked a little. The VIA KT400 chipset follows this trend too. As of CeBit 2003, VIA made it known that another chipset would be hitting the markets later this year called the KT400A which would address many of the performance issues some say the KT400 is facing. Ironically, the KT400A doesn't support 400 MHz FSB or AGP/PCI locking either; " The VIA Apollo KT400A takes the AMD Athlon XP processor to the summit of system performance with a FastStream64 memory controller technology, 333MHz Front Side Bus, DDR400 memory, AGP 8X Graphics, 6-Channel Audio, Serial ATA, ATA-133, USB 2.0 and 8X V-Link chip interconnect." With Albatron's history of delivering some pretty fine motherboards in mind, there was a lot of anticipation in the lab as we set out with a fresh pair of Corsair XMS3500 DDR in hand to see how the KX400-8XV Pro would perform. The board itself is compact in size, and features on board 3Com 10/100 LAN, six USB2.0 ports and 5.1 audio but for $115 CDN ($75 US). That price makes the KX400-8XV Pro one of the most aggressively priced motherboards on the market with a KT400 chipset under the hood. If you need to expand a bit more, there are five PCI slots and a 8x AGP slot. The three 184-pin DIMM's support up to a maximum of 3GB of double-sided PC1600/2100/2700/3200 DDR, and the motherboard can be used with any current 200/266/333 MHz based AthlonXP processor. Albatron opted to locate all the USB connectors down at the bottom of the motherboard which helps to keep the cables out of the way of the other devices. 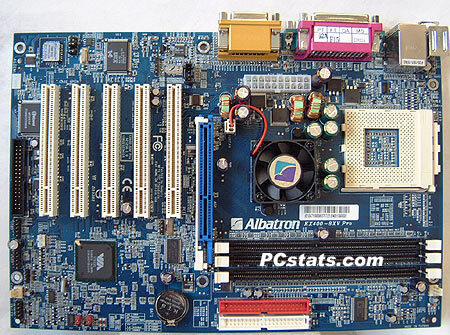 It's nice to see Albatron can still include quality parts on their "budget" motherboards too - where most other manufacturers would typically use the Realtek 8100B NIC on their motherboards, the KX400-8XV Pro has a 3Com chipset. Because of it's relatively compact size, installing memory on this board will require you to remove the videocard first. I would have liked to seen the four mounting holes around the Socket 462, but that isn't the case. If you'd hoped to bolt on a large heatsink you are 100% out of luck, and this trend is seems to steam rolling as few and fewer boards come equipped with AMD mounting holes around the CPU socket. My only legitimate qualms with the layout of the board is the location of the floppy drive connector. Situated at the very base of the board it is highly likely that users of some cases which place the floppy at the very top of the case may have a harder time connecting up their floppy drive. Up next, we see how far we can overclock the KT400-based KX400-8XV Pro motherboard.